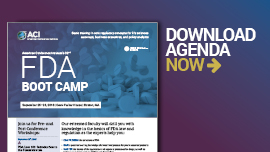 ACI’s FDA Boot Camp returns with a renewed focus to provide individuals working within the pharmaceutical space with the critical regulatory knowledge, core FDA concepts, and real world examples they require to excel in their everyday practices. In addition to providing a “101” training, our updated agenda offers advanced guidance sessions discussing the pathways to approval, a patent and IP overview for pharmaceuticals, post-approval issues, and recalls and withdrawals. In addition, each step of the process comes with strategies to apply this knowledge to real-life situations. Highlights from this year’s program include an up-to-the-minute “Ripped from the Headlines” section covering recent hot issues such as the FDARA, the states attempts to affect drug pricing, and the potential effects of the mid-term elections on federal legislation and FDA regulations. Register to this conference now and learn to navigate your way through the regulatory maze that plays such a crucial role to your cases and practice areas. BE PART OF ACI’S LIFE SCIENCES COMMUNITY! In-House General Counsel, Head of IP, Directors of IP, Patents and Legal Affairs, VP of Patents, IP Counsel, IP/Patent Managers, Head of Regulatory, Regulatory Affairs Managers, Private Practice Lawyers and Patent Attorneys, and many more.